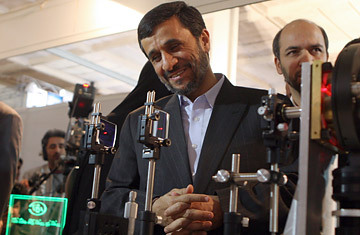 Iranian President Mahmoud Ahmadinejad tours an exhibition on laser technology in Tehran on February 7, 2010. Ahmadinejad ordered Iran's atomic chief to enrich uranium to 20 percent, in a fresh challenge to world powers days after appearing to accept a UN-drafted nuclear fuel deal. Iran: Can Sanctions and Diplomacy Be Combined? In late 2006, George W. Bush met with the Joint Chiefs of Staff at the Pentagon and asked if military action against Iran's nuclear program was feasible. The unanimous answer was no. Air strikes could take out some of Iran's nuclear facilities, but there was no way to eliminate all of them. Some of the nuclear labs were located in heavily populated areas; others were deep underground. And Iran's ability to strike back by unconventional means, especially through its Hizballah terrorist network, was formidable. The military option was never officially taken off the table. At least, that's what U.S. officials always said. But the emphasis was on the implausibility of a military strike. "Another war in the Middle East is the last thing we need," Secretary of Defense Robert Gates wrote in 2008. It would be "disastrous on a number of levels." Other intelligence sources say that the U.S. Army's Central Command, which is in charge of organizing military operations in the Middle East, has made some real progress in planning targeted air strikes  aided, in large part, by the vastly improved human-intelligence operations in the region. "There really wasn't a military option a year ago," an Israeli military source told me. "But they've gotten serious about the planning, and the option is real now." Israel has been brought into the planning process, I'm told, because U.S. officials are frightened by the possibility that the right-wing Netanyahu government might go rogue and try to whack the Iranians on its own. One other factor has brought the military option to a low boil: Iran's Sunni neighbors really want the U.S. to do it. When United Arab Emirates Ambassador Yousef al-Otaiba said on July 6 that he favored a military strike against Iran despite the economic and military consequences to his country, he was reflecting an increasingly adamant attitude in the region. Senior American officials who travel to the Gulf frequently say the Saudis, in particular, raise the issue with surprising ardor. Everyone from the Turks to the Egyptians to the Jordanians are threatening to go nuclear if Iran does. That is seen as a real problem in the most volatile region in the world: What happens, for example, if Saudi Arabia gets a bomb, and the deathless monarchy there is overthrown by Islamist radicals? For the moment, the White House remains as skeptical as ever about a military strike. Most senior military leaders also believe Gates got it right the first time  even a targeted attack on Iran would be "disastrous on a number of levels." It would unify the Iranian people against the latest in a long series of foreign interventions. It would also unify much of the world  including countries like Russia and China that we've worked hard to cultivate  against a recowboyfied U.S. There would certainly be an Iranian reaction  in Iraq, in Afghanistan, by Lebanese Hizballah against Israel and by the Hizballah network against the U.S. and Saudi homelands. A catastrophic regional war is not impossible. Of course, it is also possible that this low-key saber-rattling is simply a message the U.S. is trying to send the Iranians: it's time to deal. There have been rumblings from Tehran about resuming negotiations, although the regime has very little credibility right now. The assumption  shared even by some of Iran's former friends, like the Russians  is that any Iranian offer to talk is really an offer to stall. A specific, plausible Iranian concession may be needed to get the process back on track. But it is also possible that the saber-rattling is not a bluff, that the U.S. really won't tolerate a nuclear Iran and is prepared to do something awful to stop it.